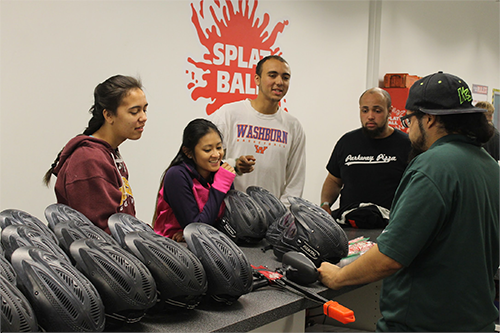 Choosing the rental package that’s right for you will help you get the most out of your experience at Splatball. Whether you’re a new player or an experienced player, we have the perfect rental package for you. You’ll find Splatball has the best selection of rental gear in Minnesota. If you’re a first time player, you may not have clothing that you want to wear while playing paintball. Paintball can be a messy game. Our Ultimate Combat Package comes with a camo jumpsuit that helps keep the mess off of you and your clothing. You also don’t have to worry about the mess following you into your car and into your home. Also included in the Ultimate Combat package is a pair of padded gloves. Your hands are one of the most exposed parts of your body when playing paintball. Shots to the hand can be unpleasant. The combat vest included in the package provides protection to your torso. It also has pockets to store extra paintballs. Your Ultimate Combat Package also comes with a free Splatball t-shirt that’s yours to keep. It’s just our way of say, “thanks for playing paintball with us”. The premium rental package is a Planet Eclipse Etek paintball marker. This top-of-the-line paintball marker features an electronic firing system and a lighter air tank. It’s lighter than our standard rental package, making it a great option for younger players. The standard rental package is a Tippmann FT-50 with a larger air tank. Though it’s heavier than the premium rental package, it is a good alternative for the budget minded player.